There is a FREE Pokémon Trade & Collect Event at Toys R Us on October 30 from 2pm – 4pm and again on November 20 from 2pm – 4pm. *Plus get there early, the first 50 attendees will receive a Pokémon Figure. 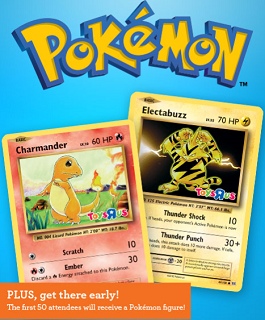 Receive a FREE Charmander Foil Card & Pokémon TCG Collectors Album (10/30). Electabuzz Foil Card, Pokémon TCG Collectors Album & A Pikachu Poster (11/20). *Excludes Express and Outlet locations. Event open to kids ages 6-up and adult collectors. Parental supervision required at all times for minors. All giveaways and event materials available while supplies last and distributed to participants only. Limit one per customer. Quantities limited; no rain checks. We found some Skylander Swap Team figurines for as low as $3.50! These will sell out fast so grab them while you can. If you have time tomorrow if they are in stock in your area these would make a great stocking stuffer.